Before us is the most important chapter in this book, or as most Christians would agree, “The most important chapter of human history.” This theme cannot be broken apart into smaller portions even for the convenience of the reader. This is the heart of the Gospel, and if we must labor through it, it is worthy labor indeed! 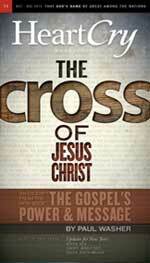 One of the greatest maladies of contemporary Gospel preaching is that the Cross of Christ is rarely explained. It is not enough to say that, “He died” – for all men die. It is not enough to say that, “He died a noble death” – for martyrs do the same. We must understand that we have not fully proclaimed the death of Christ with saving power until we have cleared away the confusion that surrounds it and expounded its true meaning to our hearers – He died bearing the transgressions of His people and suffering the divine penalty for their sins: He was forsaken of God and crushed under the wrath of God in their place. In light of what we know about the impeccable nature of the Son of God and His perfect fellowship with the Father, the Messiah’s words are difficult to comprehend, yet in them, the meaning of the Cross is laid bare, and we find the reason for which He died. The fact that His words are also recorded in the original Hebrew tongue, tells us something of their great importance. The author did not want us to misunderstand or to miss a thing! In the first and second verses, we hear the Messiah’s complaint – He considers Himself forsaken of God. Mark uses the Greek word egkataleípo, which means to forsake, abandon, or desert.2 The psalmist uses the Hebrew word azab, which means to leave, loose, or forsake.3 In both cases, the intention is clear. The Messiah Himself is aware that God has forsaken Him, and turned a deaf ear to His cry. This is not a symbolic or poetic forsakenness. It is real! If ever a person felt the forsakenness of God, it was the Son of God on the Cross of Calvary! The apparent contradiction is clear. There had never been one instance in the history of God’s covenant people that a righteous man cried out to God and was not delivered. However, now the sinless Messiah hangs upon a tree utterly forsaken. What could be the reason for God’s withdrawal? Why did He turn away from His only begotten Son? This dark metaphor of the Messiah dying as worm is not alone in Scripture. There are others that take us even deeper into the heart of the Cross and lay open for us what “He must suffer” in order to accomplish the redemption of His people.6 If we shutter at the words of the psalmist, we will be further taken back to read that the Son of God is also likened to a serpent lifted up in the wilderness, and to two sin-bearing goats – one slaughtered and the other driven out. We must be careful to understand that this truth does not diminish the horrifying nature of Christ being “made sin” on our behalf. Although it was an imputed guilt, it was real guilt, bringing unspeakable anguish to His soul. He truly stood in our place, bore our sin, carried our guilt, and experienced the full measure of the wrath of God due our sin. The agony which Christ experienced in being “made sin” is further revealed in the great contrast between what He truly was and what He was “made” to be. It is a dreadful experience for the sinner to come face to face with his own sin and feel the weight of his own guilt. It is quite another thing for the “One who knew no sin” to bear a filth that was totally foreign to Him and to feel the guilt of a countless multitude of sinners. It is an unspeakable terror for the sinner to be treated as guilty before the bar of God, but it is quite another thing for One who is “innocent, undefiled, and separated from sinners” to be so treated.24 It is one thing for the sinner to be condemned by a God with whom he has no relations and toward whom he possesses no affections. It is quite another thing for the beloved Son of God to be judged and condemned by His own Father with whom He had shared the most intimate communion throughout eternity and toward whom He possessed a love beyond definition and measure. That Christ was “made sin,” is a truth as terrible as it is incomprehensible, and yet, just when we think that no darker words can be uttered against Him, the Apostle Paul lights a lamp and takes us further down into the abyss of Christ’s humiliation and forsakenness. We enter the deepest cavern to find the Son of God hanging from the Cross and bearing His most infamous title – Accursed of God! The word “cursed” comes from the Greek word katára which denotes an execration, imprecation, or malediction. In the New Testament, it refers to the state of being under divine disapproval or reprobation leading to judgment and condemnation. The divine curse is the antonym of divine blessing, therefore, by using the Beatitudes as our standard, we can learn something of what it means to come under the curse of God. The blessed are granted the kingdom of heaven. The cursed are refused entrance. The blessed are recipients of divine comfort. The cursed are objects of divine wrath. The blessed inherit the land. The cursed are cut off from it. The cursed are miserable and wretched. The cursed are condemned without pity. The blessed shall see God. The cursed are cut off from His presence. The blessed are sons and daughters of God. From heaven’s perspective, those who break God’s Law are vile and worthy of all loathing. They are a wretched lot, justly exposed to divine vengeance, and rightly devoted to eternal destruction. It is not an exaggeration to say that the last thing that the accursed sinner should and will hear when he takes his first step into hell is all of creation standing to its feet and applauding God because He has rid the earth of him. Such is the vileness of those who break God’s law, and such is the disdain of the holy towards the unholy. Such language is a gross offense to the world and to much of the contemporary evangelical community. Nevertheless, it is biblical language and it must be said. If for etiquette’s sake we refuse to explain and illustrate the “dark sayings” of Scripture, then God will not be held as holy, men will not understand their dreadful predicament, and the price paid by Christ will never be calculated or appreciated. Unless we comprehend what it means for man to be under the divine curse we will never comprehend what it meant for Christ to “become a curse for us.” We will never fully understand the horror and beauty of what was done for us on that tree! The truth conveyed in this text is what made Jesus Christ and His Gospel such a scandal to the Jews of the first century. They were all familiar with the terrifying truth of Scripture that “He who is hanged is accursed of God.”28 How then could the Messiah be the Deliverer and King of Israel and yet die in such a degrading and accused fashion? To entertain such an idea was more than scandalous, it was outright blasphemy! Yet the Jews failed to see that it was an “exchanged curse,” and that it was necessary for the Christ to become what they were in order to redeem them from what they deserved.29 He became a worm and no man, the serpent lifted up in the wilderness, the scapegoat driven outside the camp, the bearer of sin, and the One upon whom the curse of God did fall. And He did it all in the place of His people! Yet on the Cross, the sin imputed to Christ was exposed before God and the host of heavens. He was placarded before men and made a spectacle to angels and devils alike.49 The transgressions He bore were not forgiven Him, and the sins He carried were not covered. If a man is counted blessed because iniquity is not imputed to Him, then Christ was cursed beyond measure because the iniquity of us all fell upon Him.50 For this reason, He was treated as the covenant breaker spoken of at the renewal of the Mosaic covenant in Moab. The Psalmist describes “the blessed” as those who are made joyful with gladness in God’s presence, who know the joyful sound of the festal shout, and who walk in the light of His countenance.56 For our sakes, Christ was made sorrowful with the absence of His Father’s presence, He came to know the terrifying sound of judgment’s trumpet, and He hung in the darkness of God’s unbearable frowning countenance. Because of Adam’s fateful choice, the entire creation groaned under the curse and was enslaved to corruption and futility.57 To liberate creation, the Last Adam took upon Himself the sins of His people and groaned under the dreadful yoke. To obtain the salvation of His people, Christ suffered the terrifying abandonment of God, drank down the bitter cup of God’s wrath, and died a bloody death in the place of His people. Only then could divine justice be satisfied, the wrath of God be appeased, and reconciliation be made possible. It is often said that the cup represented the cruel Roman cross and the physical torture that awaited Him. That Christ foresaw the cat of nine tails coming down across His back, the crown of thorns piercing His brow, and the primitive nails driven through His hands and feet. However those who believe these things to be the source of His anguish do not understand the Cross, nor what happened there. Although the tortures heaped upon Him by the hands of men were all part of God’s redemptive plan, there was something much more ominous that evoked His cry for deliverance. In the first centuries of the primitive church, thousands of Christians died on crosses. It is said that Nero crucified them upside down, covered them with tar, and set them aflame to provide streetlights for the city of Rome. Throughout the ages since then, a countless stream of Christians have been led off to the most unspeakable tortures, and yet it is the testimony of friend and foe alike that many of them went to their death with great boldness. Are we to believe that the followers of the Messiah met such cruel physical death with joy unspeakable, while the Captain of their Salvation cowered in a garden, fearing the same torture?65 Did the Christ of God dread whips and thorns, crosses and spears, or did the cup represent a terror infinitely beyond the greatest cruelty of men? As a result of the unceasing rebellion of the wicked, the justice of God had decreed judgment against them. He would rightly pour forth His indignation upon the nations. He would put the cup of the wine of His wrath to their mouth and force them to drink it down to the dregs.68 The mere thought of such a fate awaiting the world is absolutely terrifying, yet this would have been the fate of all, except that the mercy of God sought for the salvation of a people, and the wisdom of God devised a plan of redemption even before the foundation of the world.69 The Son of God would become a man and walk upon the earth in perfect obedience to the Law of God. He would be like us in all things, and tempted in all ways like us, but without sin.70 He would live a perfectly righteous life for the glory of God and for the benefit of His people. Then in the appoint time, He would be crucified by the hands of wicked men, and on that Cross, He would bear His people’s guilt, and suffer the wrath of God against them. The perfect Son of God and a true Son of Adam together in one glorious person would take the bitter cup of wrath from the very hand of God and drink it down to the dregs. He would drink until it was finished, and the justice of God was fully satisfied.71 The divine wrath that should have been ours would be exhausted upon the Son, and by Him, it would be extinguished. Imagine an immense dam that is filled to the brim and straining against the weight behind it. All at once, the protective wall is pulled away and the massive destructive power of the deluge is unleashed. As certain destruction races towards a small village in the nearby valley, the ground suddenly opens up before it and drinks down that which would have carried it away. In similar fashion, the judgment of God was rightly racing toward every man. Escape could not be found on the highest hill or in the deepest abyss. The fleetest of foot could not outrun it, nor could the strongest swimmer endure its torrents. The dam was breached and nothing could repair its ruin. But when every human hope was exhausted, at the appointed time, the Son of God interposed. He stood between divine justice and His people. He drank down the wrath that we ourselves had kindled and the punishment we deserved. When He died, not one drop of the former deluge remained. He drank it all on our behalf! We should not think that God found some gleeful pleasure in the suffering of His beloved Son, but through His death, the will of God was accomplished. No other means had the power to put away sin, satisfy divine justice, and appease the wrath of God against us. Unless that divine grain of wheat had fallen to the ground and died, it would have abided alone without a people or a bride.73 The pleasure was not found in the suffering, but in all that such suffering would accomplish: God would be revealed in a glory yet unknown to men or angels, and a people would be brought into unhindered fellowship with their God. Father: My Son, here is a company of poor miserable souls, that have utterly undone themselves, and now lie open to my justice! Justice demands satisfaction for them, or will satisfy itself in the eternal ruin of them: What shall be done for these souls? And thus Christ returns. Son: O my Father, such is my love to, and pity for them, that rather than they shall perish eternally, I will be responsible for them as their Surety; bring in all thy bills, that I may see what they owe Thee; Lord, bring them all in, that there may be no after-reckonings with them; at my hand shall thou require it. I will rather choose to suffer their wrath than they should suffer it: upon me, my Father, upon me be all their debt. It is sometimes thought and even preached that the Father looked down from heaven and witnessed the suffering that was heaped upon His Son by the hands of men, and that He counted such affliction as payment for our sins. This is heresy of the worst kind. Christ satisfied divine justice not by merely enduring the affliction of men, but by enduring the wrath of God. It takes more than crosses, nails, crowns of thorns, and lances to pay for sin. The believer is saved, not simply because of what men did to Christ on the Cross, but because of what God did to Him – He crushed Him under the full force of His wrath against us.75 Rarely is this truth made clear enough in the abundance of all our Gospel preaching! In one of the most epic narratives in the Old Testament, the patriarch Abraham is commanded to carry his son Isaac to Mount Moriah, and there, to offer him as a sacrifice to God. What a burden was laid upon Abraham! We cannot even begin to imagine the sadness that filled the old man’s heart and tortured him every step of his journey. The Scriptures are careful to tell us that he was commanded to offer “his son, his only son, whom he loved.” The specificity of the language seems designed to catch our attention and make us think that there is more meaning hidden in these words than what first glance can tell; that this man and this boy are simply types or shadows of a greater Father, a greater Son, and a greater sacrifice! As the curtains draw to a close on this epic moment in history, not only Abraham, but also everyone who has ever read this account, breathes a sigh of relief that the boy is spared. We think to ourselves what a beautiful ending to the story, but it was not an ending, it was a mere intermission! The curtains are drawn on a dead Messiah, but it is still not the end. One more scene remains... A resurrection is to follow and a great coronation is to be held! 21 I owe this thought to John Calvin and his commentary on II Corinthians. 32 I owe this thought to R.C. Sproul and his sermon on Galatians 3:13 preached at the 2008 Together for the Gospel Conference. 55 Numbers 6:22-27. I owe this thought to R.C. Sproul and his sermon on Galatians 3:13 preached at the 2008 Together for the Gospel Conference. 68 The residue or sediment left at the bottom of the wine flask.